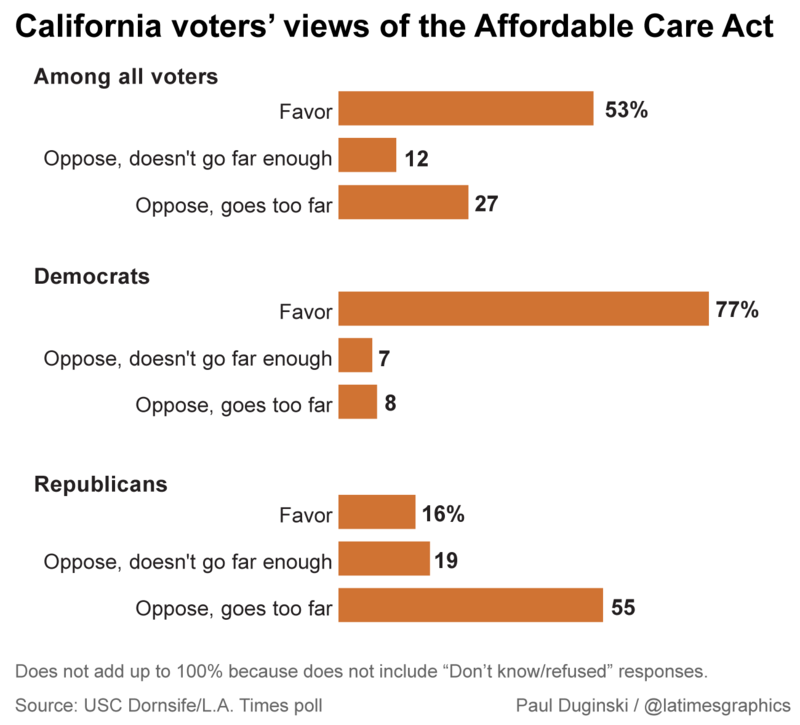 Six years after President Obama signed the Affordable Care Act, the health reform law has gained acceptance from a majority of California voters, but the cost of getting healthcare remains a major concern, eclipsing worries about having insurance, according to a new USC Dornsife/Los Angeles Times poll. The widespread worry about costs indicates a potential shift in the debate over healthcare, at least in this heavily Democratic state. Nationally, the political debate has been stuck for most of the last six years on Republican efforts to block Obamacare, but that gridlock could lessen after the election. In both parties, lawmakers increasingly have been hearing complaints from their constituents about the cost of care, and polls have found that prescription drug prices, surprise medical bills and other pocketbook issues concern voters more than the future of the health law. Echoing that national trend, almost two-thirds of voters in the USC/Times survey say they worry "very much" about rising health costs, with only 10% saying that is not something they worry about. Just slightly more than half say that lack of insurance is something they worry about a lot, and roughly three in 10 say they were not worried about it. Latinos, however, were an exception, reporting equal levels of unease about cost and having insurance – three-quarters said they were very worried about each. Cost concerns were most widespread among those in their 50s and early 60s. Indeed, that age group consistently showed the highest levels of anxiety on a series of healthcare concerns. By contrast, those over age 65, most of whom are covered by Medicare, were the least likely to express worry about healthcare issues. For a significant number of voters, the healthcare law itself takes blame for rising costs. Just over half of those surveyed said they believed that costs for average Americans have "gone up a lot" because of the law, compared with roughly one-third who said that the law had not caused that to happen. As with many aspects of the healthcare debate, partisanship plays a big role in shaping beliefs about rising costs: Republicans by overwhelming margins blame the law, while Democrats were split closely on whether it's responsible. Most Americans have been forced to confront increased costs for health coverage for years – a trend that began long before the passage of the reform law. Employers have continued to shift costs to their workers, mostly in the form of higher deductibles and co-payments. Although those higher costs may not have been caused by the new law, many blame it. The law clearly has raised costs for one relatively small slice of Americans – mostly healthy, self-employed people with middle-class or higher incomes who were previously able to buy low-cost policies on the private market. The new law requires those people to buy more comprehensive policies, which provide greater coverage, but at a higher price. Covering sicker customers who used to be denied insurance has also led insurers to raise some premiums. Low- and middle-income Americans get subsidies under the law that lower their monthly premiums, but higher-income Americans do not. More than three-quarters of California voters acknowledge the biggest effect the law has had – reducing the number of Americans who lack health coverage. By 77% to 15%, voters said that the law had achieved that goal. Since the new law's coverage expansion began in 2014, some 20 million previously uninsured Americans have gained coverage, and the share of American adults under age 65 who are uninsured has dropped from one in five to about one in eight, according to numerous private and government surveys. But on that point, too, partisanship colors perceptions. Among Republicans, 28% in the current survey said that the new law had not led to more people having insurance. Among Republicans who identify with the tea party, 48% took that view, compared with 31% who said the law had reduced the number of uninsured. The public's view remains split on another of the law's major accomplishments, as well – ending the ability of insurers to deny health coverage because of preexisting health conditions. The poll found 59% of voters saying that coverage could no longer be denied, while 21% said that had not happened. On that question, the division did not appear primarily partisan. Instead, some of the groups whom the new law was designed to help most appeared least aware of one of its central elements. Latinos, those younger than 30 and people with incomes under $30,000 were all less aware of the change regarding preexisting health conditions than whites and those who were older or more affluent. Among Latinos, for example, though 48% said the law had accomplished that goal, 30% said it had not. That lack of awareness of one of the law's main achievements marks a "messaging failure" by the law's supporters, said Anna Greenberg, the Democratic pollster whose firm forms one half of the bipartisan team that produced the survey for USC and The Times. The White House and its allies have struggled at times to convey a message about the law, in part because for many Americans, it remains an abstraction. Just over half of those surveyed said the law had no effect on themselves or their families. That's by design: The law was written to cover the uninsured while minimizing the effect on people who get coverage through their jobs, as most working-age Americans do. That has cost Obama politically. The views that most Americans have of the law have been shaped less by direct experience than by partisanship, according to Drew Altman, the president of the Kaiser Family Foundation, which has carefully tracked opinion about the health law. Only about four in 10 of those who supported the law in the poll also said it had made their own families' healthcare better. Overall, 53% of the state's voters favor the law, with 31% favoring it strongly. An additional 12% said they opposed it because it did not go far enough, while 27% said they opposed it because it went too far. Those who said the law did not go far enough do not consistently back liberal views on how to replace it. Only 40%, for example, supported a single-payer system – the sort of healthcare solution advocated by Sen. Bernie Sanders in his campaign for president. By contrast, those who support the law backed the single-payer idea 69% to 10%. Overall, just over half of the state's voters supported it, with about one-quarter opposed. The state's voters divided evenly on the question of whether to repeal the law's requirement that people have insurance. Opinion on that question split along predictable partisan lines with one significant exception – Latinos, who generally back the law, also supported repeal of the mandate, by 57%-37%. Most California voters have a positive view of their own healthcare and a somewhat positive view of healthcare in the state, the poll found. Seven in 10 rated their own healthcare as "excellent" or "good" while just under three in 10 called their care "fair" or "poor." Ratings were highest among those earning more than $100,000 a year and among those aged 65 and older, which reflects the generally positive view that Americans have of Medicare. Asked about the state of healthcare in California, 44% called it excellent or good, while 34% said fair and 14% poor. Ratings were gloomier about healthcare nationwide, with only 30% calling it either excellent or good, 39% fair and 25% poor. The poll for the USC Dornsife College of Letters, Arts and Sciences and the Los Angeles Times was conducted jointly by the Democratic firm Greenberg Quinlan Rosner Research and the Republican firm American Viewpoint. It questioned 1,500 registered California voters from May 19-31. The margin of sampling error is 2.9 points in either direction for the full sample.